Maria Manton’s style of post-war abstraction lays emphasis on solid line, geometry and harmonious colour (predominantly Mediterranean shades of ochre, red, blue and brown). Born in Blidah, Algeria, Manton studied at the Beaux-Arts of Algeria and, under the influence of Cubism, began her first abstract works in 1947. In that year she took part in the “Ecole de Paris” exhibition organised by the author and critic Gaston Diehl, having just moved to Paris with her husband, the painter Louis Nallard. In 1948 she exhibited at Galerie Colette Allendy, and the following year along with Hartung, Schneider and Soulages at Galerie Lydia Conti, one of the great champions of post-war abstraction, and she had her first solo exhibition at the gallery in 1950. In 1948 her work received international attention in the travelling “Exhibition of Contemporary French Art” which toured Rio de Janeiro, Sao Paolo and Buenos Aires. At the end of that year she also began exhibiting at the Salon des Réalités Nouvelles dedicated to geometric abstraction, subsequently becoming a committee member in 1960 and Secretary-General in 1961 (a post she held until the 1990’s). She also participated in the Salon de Mai and at the Salon Comparaisons. The 1950’s saw European acclaim of Manton’s work, with exhibitions of her painting in Austria, Belgium, Germany, Italy and Yugoslavia. 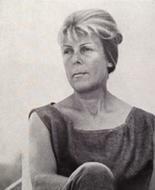 In Paris she exhibited at Galerie Arnaud in 1954 and 57, (where the present work was exhibited); and in 1956 she held the first of several exhibitions at the Galerie La Roue. In 1960 she took part in the important “Ecole de Paris” show at the Musée de Lyon and, in 1964, was represented in the equally influential “Fifty Painters of the Réalités Nouvelles” at the Maison de la Culture, Namur. “Maria Manton: 40 Years of Painting” was put on by the Evreux Maison de la Culture; and the Galerie Callu Merite, Paris, held retrospectives of her work in 1987, 1990 and 1992 (this last, a comprehensive overview covering the years 1946–1992). In 2003 the Musée de Villeneuve-sur-Lot held an exhibition “Mère Algérie”, on the eve of which she passed away. The artist’s work is now represented in various public collections including the Musée National d’Art Moderne, Paris; Musée d’Art Moderne de Paris, National Museum of Art, Algiers; Dueren Museum, Germany; National Museum of Art, Budapest.